Watch out! It’s episode 15! Find it on iTunes, Podbean or search for us! We have a new science guest for you this week. We’re joined by Yaz who will be leading us through the world of neurodegeneration (prize for guest with the nicest voice as well). Persevere through Alice’s dull story and learn with our lay guest Sophie (musician and translator) about the little known sensations of pain in Parkinson’s disease and a… cure for Huntingtons?! (Spoiler alert: Definitely not a cure). Disclaimer: We will be discussing animal work in this episode. We would love to hear from you. You can find us on instagram or twitter @layitoutpodcast. Or you can e-mail us at layitoutpodcast@gmail.com. We’re back to our normal format but Silent Demelza doesn’t seem to want to stay silent! Find it on iTunes, Podbean or search for us! We’re joined this week by Lee (a paediatric physiotherapist) and Poppy (a creative translator)! Curie explores the first real evidence that misophonia might need to be classified as a medical disorder and Alice blasts a sensationalised headline by the, usually very trustworthy, Guardian, on probiotics and the gut. We would love to hear from you. You can find us on instagram or twitter @layitoutpodcast. Finally, you can e-mail us at layitoutpodcast@gmail.com. Episode 13 is here with another science guest for some fascinating psychology! We’re back and we are getting Psychological this week as we welcome our next science guest! Check us out try to convince him to admit he works for national intelligence. If that doesn’t tickle your fancy Curie explains why she is the Smith of Korea and Alice tells a really interesting story about her morning commute. NOT TO BE MISSED!! We would love to hear from you with any suggestions, requests or comments. You can find us on Twitter and Instagram @layitoutpodcast. Finally, you can e-mail us at layitoutpodcast@gmail.com. It’s the return of Natalie and Dan for episode 12! Our first repeat guests join us as we discuss how Air On The G String (giggidy) can make our food taste better and how an Xbox could potentially change the lives of MS patients for the better. We have some special guests for our 11th episode! We welcome hosts of the Well, Blactually Podcast along to chat all things science. This week, Curie takes a nap in an MRI scanner and Alice has had a long week (what’s new you ask?!). Tune in as we attempt to blow their minds with the science behind the 5:2 diet and the humble chicken egg. Does alcohol give you a dirty mouth? A few drinks tend to make some people a little mouthier than usual. But in this case, we’re talking about the bacteria that live in your mouth. Read on or head on over to episode 6 of the podcast to hear more about this and a potential new “cure” for Alzheimer’s disease. We’ve learned all about the ins and outs of your gut microbiome in previous posts, but here we’re looking at your oral microbiome: the bacteria that reside on your gums, tongue and teeth. Why do we care about the bacteria in your mouth? We tend to think that a varied, balanced microbiome is a healthy microbiome. When some species of bacteria become too abundant and take over – dysbiosis – problems can occur. There are at least 700 different species of bacteria that live in your mouth. Dysbiosis of these bacteria has been linked with oral diseases like gingivitis, but also various cancers and even heart disease. Chronic alcohol consumption has also been associated with these same diseases, therefore some scientists think that dysbiosis could be the link between the two: too much alcohol changes the bacteria in your mouth which can lead to health problems. Properly understanding how alcohol affects the oral microbiome could provide the final link in this pathway. Although studies using animals and small groups of humans have found a link between drinking alcohol and changes in mouth bacteria, there have not been any large-scale population studies looking at the effect of the amount of alcohol drank and the types of alcoholic drink. A research group in New York decided to tackle this. It’s our 10th episode!!! We’re super excited about it 🙂 This week we discuss two very important issues: periods and sleep! Listen below or head on over to Apple Podcasts, Podbean, Google Play or search for us. After some very intense girl chat we introduce our second science guest, Dr Haya. Our guest this week is especially exciting because Haya actually wrote the paper she discusses herself. With her expertise at hand we discuss how important sleep is for our health and what we can do to improve it. We would love to hear from you. 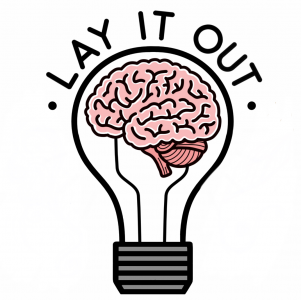 You can find us on instagram or twitter @layitoutpodcast or you can e-mail us at layitoutpodcast@gmail.com.